Even after twelve years successful years, Birmingham’s German market is still attracting over 3 million visitors each year. 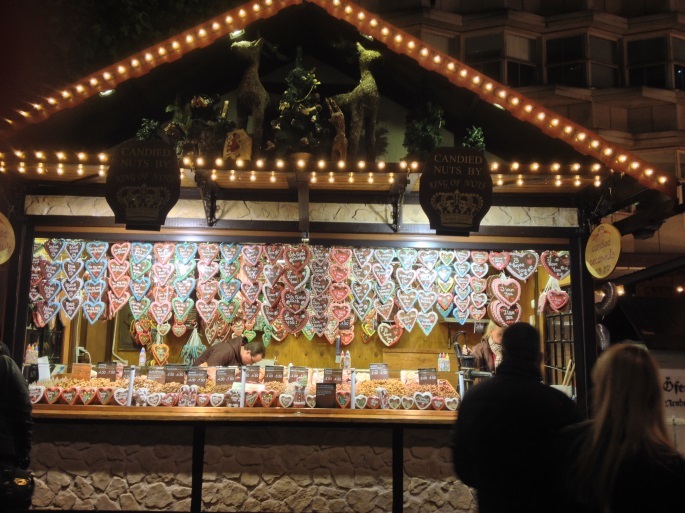 Having become quite a popular and profitable Christmas tradition, numerous German-style Christmas markets have cropped up all over Britain in the last fifteen years. 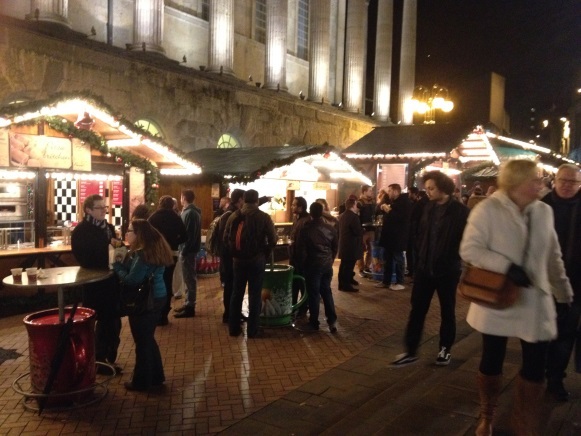 However Birmingham’s market has managed to remain the largest German-style Christmas market outside Germany and the German-speaking countries. Running from the 14th of November until 22nd December, the population of Birmingham and the many tourists who flock to the city centre around Christmas have ample time to pay the market a visit. The market follows the length of New Street, winds up around Victoria and Chamberlain square and concludes in Centenary Square by Symphony Hall. In order to have a proper look around the stalls I’d advise avoiding the weekend, going on a week-night evening, so as to avoid the crowds whilst still soaking up the evening atmosphere. 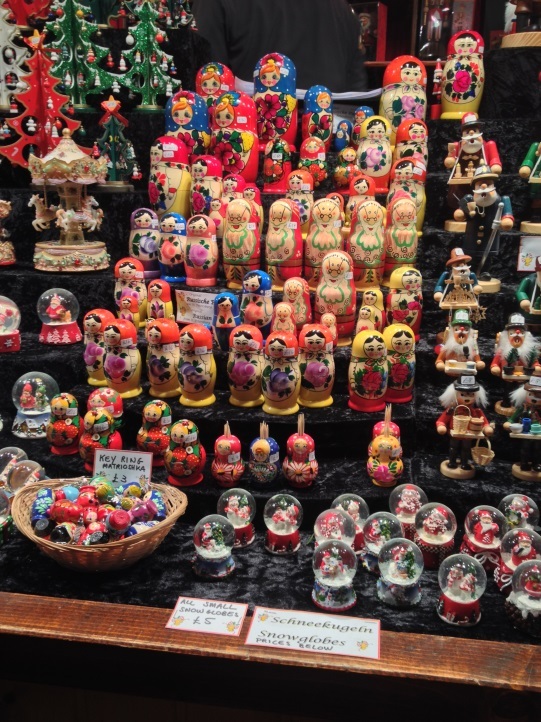 In terms of what the German market has to offer; to ask what it doesn’t have to offer seems more appropriate. For me, the food stalls were especially appealing, and one recommendation would definitely be to go there hungry. With so much food on offer, and the impossibility of being able sample it all, I would choose carefully. The authentic Bratwurst sausages, cooked on an open fire, or the pulled-pork rolls are just some of the hot foods that the market has to offer. However for those with more of a sweet tooth, there are a plethora of sweet food and chocolate stalls too. 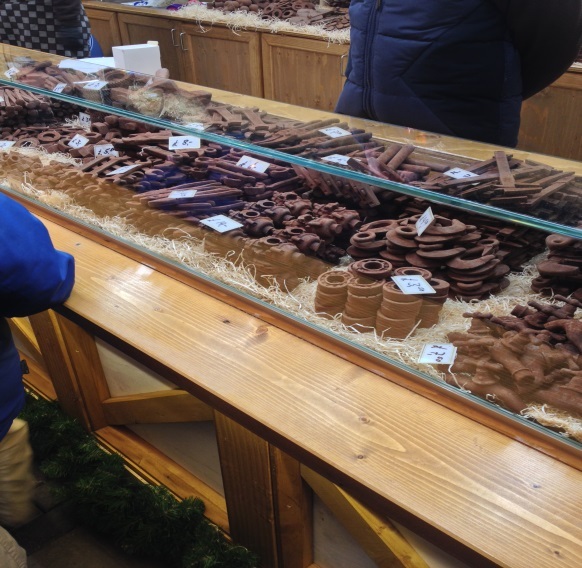 One stall that caught my eye was serving handmade chocolate that had been carved into different pieces of extremely realistic looking machinery and tools. hand-crafted gifts which you can spend a great deal of time and money on if you’re not careful. The market provides a perfect opportunity to buy Christmas gifts with a personal touch, from beautifully hand-crafted toys for children to silver jewellery, handmade soaps and candles, to authentic sheepskin rugs and clothes. 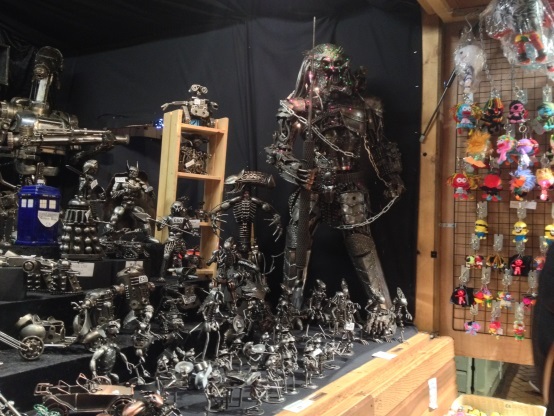 Another stall which I found fascinating was selling metal figures that had been crafted to resemble famous characters from films, one of which was a very ominous (too big for my liking) predator figurine. As well as being great for picking up unusual gifts and trinkets, the market also has a number of bars where you can stop and get a drink. A few are set up outside but there are also a handful which have indoor areas, all wooden-clad, they are usually tucked away behind the bar. On the rare occasion there’s some free space to sit down it provides a welcome break from the cold outside where you can enjoy some mulled wine or hot chocolate. year, is its authenticity. The wooden cladding of the stalls and their produce look like they’ve been plucked straight out of a small German town and dropped in the middle of Birmingham. The dual-language of the stall signs in both German and English contribute to their authentic nature, and even most of the stall-owners seem to be German. I think this aspect is what makes them particularly attractive, and provides a different take on the high-pressure, stressful process that is Christmas shopping. There have been recent arguments about the clichéd nature and dwindling novelty of the German market tradition since their success has created a ripple effect all over Britain. One article in The Guardian said, “What was once a charming, mildly exotic ‘alternative’ has now become about as painfully predictable as a trip to Boots.” Maybe I haven’t visited the market enough to become bored of its “predictability,” and whilst some of what you find that it can be tacky and clichéd, I stand firm by the idea that the German market is and will remain an enjoyable, alternative evening out for friends, couples and families who will always prefer something a little different to the overcrowded highly commercial shopping centres. 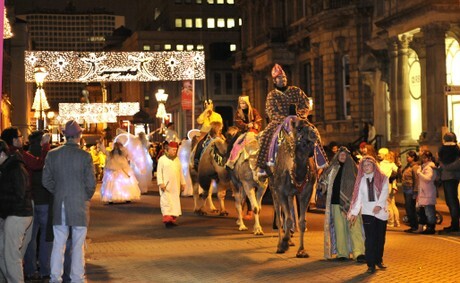 On Saturday evening celebrations for the festive season began in Birmingham with a Christmas Parade through the city. Heralding the start of preparations for the famous Frankfurt Christmas Markets that will occupy the centre from Thursday 17th of November until Christmas Eve, the parade saw Victoria Square and the surrounding streets crowded with about 35,000 people of all ages, buttoned up warm and waiting in anticipation for the procession to set off. They were in for a very varied sight: taking the lead was Santa Claus pulled in a sleigh by his reindeer, then a Nativity scene float, complete with a live donkey, closely followed by the decoratively dressed three wise men, each sitting aloof real live camels, majestically loping between the barriers of excited crowds. In a second sleigh rode Lord Mayor of Birmingham Anita Ward, alongside the Mayor’s Consort and several elves and reindeer. Next, lofty angels on stilts looking almost ethereal drifted along in their white robes, a convoy of snowy scenes lit by sparkling fairy lights and an appearance from Frosty the Snowman. Brass band carols and a rendition of ‘Winter Wonderland’ brought a warm Christmas cheer to the scene, whilst marching drummers added a real sense of occasion to the festivities, pounding the procession forwards along a two mile route of looping from Victoria Square around Colmore Row, Temple Row, Cherry Street, Bull Street, High Street and back up New Street to the Town Hall, all beneath the city centre’s sparkling Christmas lights. Also joining the parade were a snowman family, balloon red and white candy-canes bobbing along on stilts, gingerbread men and penguins, all followed up by another Santa Claus: this one with mechanical arms, towering high over the streets and interacting with the excitable crowds with shouts of ‘Happy Nearly Christmas Birmingham!’ Excitable children, clutching their glowing neon wands and bright, flashing wind spinners, gazed on entranced by the different characters and costumes as they passed. Another prominent feature of the event was the traditional carousel in Victoria Square, which is to remain for the duration of the Christmas Markets. It stands colourful and bright against the stately backdrop of the Town Hall and the delicate wisps of snow billowing from the Christmas trees on the Council House balcony. Despite the undeniable atmosphere of excitement and early sense of Christmas cheer in the air on Saturday evening, an article in the Sunday Mercury the next day suggested the parade had been cause for disappointment. Birmingham’s display was criticised as being ‘lacklustre’, causing it to be overshadowed by the efforts of rival cities and for not focusing on the ‘real meaning’ of Christmas. Sure enough, a traditional Christmas is not one where Darth Vader can be found following the nativity scene flanked by an army of Storm Troopers – indeed, this does on the surface make these criticisms appear more than justified. Other more trivial aspects such as the addition of tap dancing turkeys to the parade also raised issues of relevance and were dismissed not just as ridiculous, but as a pitiable attempt to cut costs. A spokeswoman for Birmingham City Council defended the proceedings, acknowledging the less traditional characters in the procession as a ‘different take’ on festivities, but emphasising that such additions allowed for the event to be more directed at families, particularly those with children of a young age group. It has also been revealed that some spectators voiced disappointment about no celebrity presence at the parade. However, the fact remains that were there to be an appearance of a famous face, this would most probably have been advertised to promote the event, implying that the sheer number of people who turned up to watch were purely there for the draw of a festive parade. Surely the real meaning of the Christmas season, regardless of its extra trivialities and dressing up, is the importance of family and friends, something made clear from the fantastic turn out. Possibly more importantly is a sense of community at Christmas, which was clearly illustrated by such a wealth of different people gathering at the heart of the city, whether or not a celebrity was bothering to make an appearance.